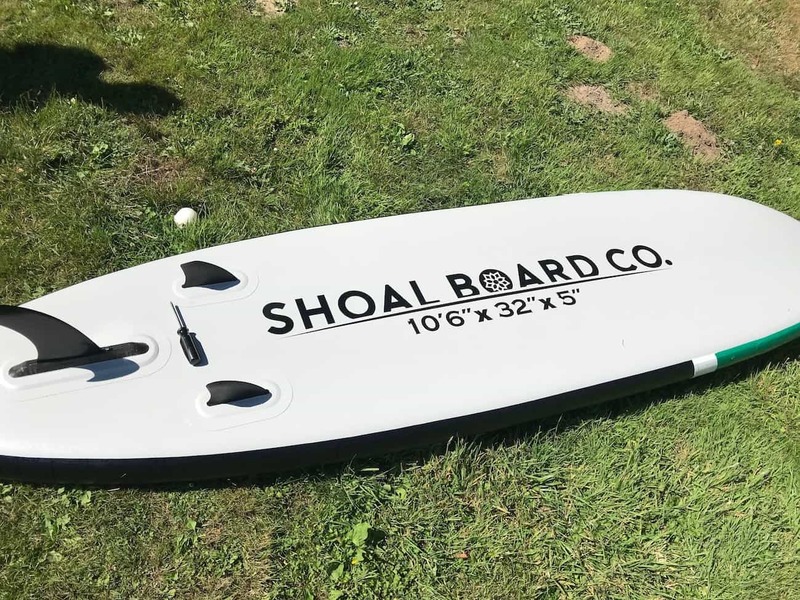 I was excited to try out the new SUP from Shoal Board Company when they reached out to me and asked if I would review their new ISUP. I was really excited to try out a new product before everyone else had done a review on it. I don’t have a ton of experience with inflatables personally as our other reviews on inflatables were not done by me personally, so I look forward to testing this out and seeing if Shoal has improved on a few downfalls a lot of inflatables have. Getting a board in a small box instead of a huge, long box is kind of nice! The box is not light though, but I’ll take that over trying to transport a 13′ + box! As you can see in the video up top, the whole thing came nicely packaged and looks to be quality. At no point in unboxing this did I get a hint that anything was cheap or corners were cut. Everything was nice, presentable and very well thought out. The bonus was the aluminum water bottle they threw in and I wasn’t expecting that. Always makes for a nice bonus and a good feeling. I think the free water bottle is part of a promotion, so please don’t think that all packages come with it as I am not 100% sure. Paddle: Carbon Fiber 3 – Piece Adjustable Paddle. Pump: Bravo Double Action Hand Pump With Pressure Gauge. Comes With: Heavy-duty backpack carry bag, Large 10″ detachable center fin, and 10′ Poly flex leash. What Is This ISUP Made Of? 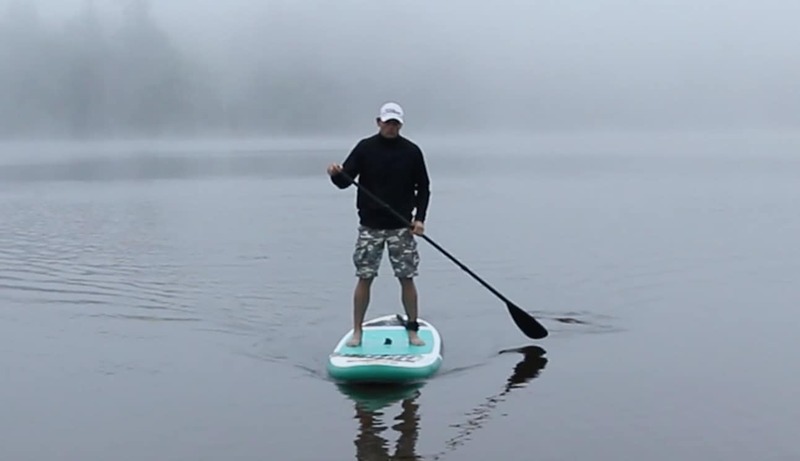 It seems that most inflatable paddle boards (ISUP’s) are made from a standard military grade PVC rubber that is drop stitched. This SUP has a double layer laminated Military Grade PVC core. It also has double thick side rails for added protection when you are bumping up against stuff which we all do. I would think that this should be a pretty durable board, only time will tell. I will try and update this blog as time passes and I learn more. “Man that carbon fiber paddle looks killer!” and “Oh wow, it is light!” I couldn’t wait to try it. As far as the board goes, I like the colors of it personally and the deck pad looks comfy which is always important. After inflating it, I was impressed how rigid it was and it amazes me how they keep their form. Forget staring at it any more, lets get out and ride it! The colors are cool (just my preference) and the design is simple and clean but nothing too fancy or flashy. I like a clean board myself, so I would prefer a smaller logo, but I understand marketing and branding so others know what you are riding. As you can see in the picture above, you don’t have to guess the size of this board as it is in bold print on the bottom of the board which is a little strange. 10’6″ x 32″ x 5″. 10’6″ is a very comfortable size for and all-around board. This should offer good stability and control. Very simple round nose design and a slight bit of rocker in the nose of the board so small chop can pass right under the board instead of into the nose or worse yet, over it. The fin setup is a triple fin setup which adds stability and straight tracking. A lot of standard All around boards have just a single 10″ fin which is a little easier to turn typically, but we will see. It feels awesome. It is comfortable and super soft on the feet which is important to me. It is comfortable even when you are kneeling on it as well. The pad is big enough to make it a good yoga board as well. Everyone that I have let try this board as liked it and mentioned that it felt comfortable as well. What About The Performance Of The Shoal ISUP? 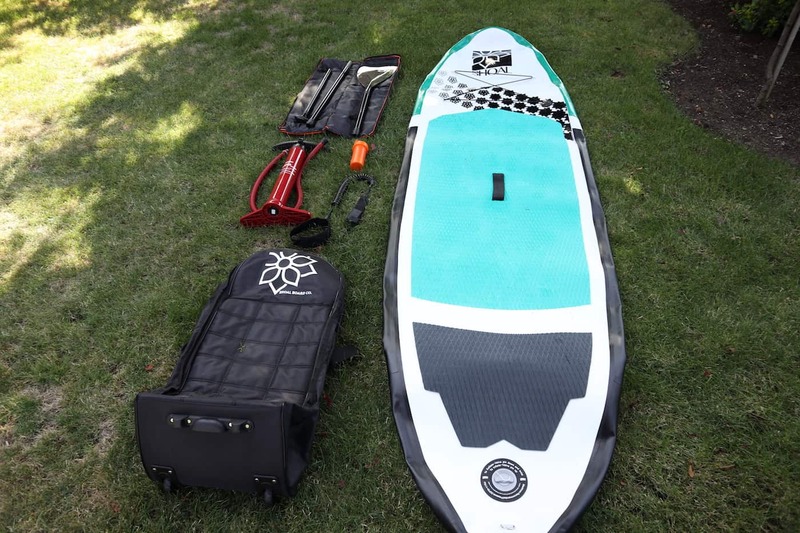 I would say right off that it feels a heavier than an ultra light board (I’d sat 28-30 lbs?) I didn’t see any weight specs anywhere so I can’t say for sure, but it feels slightly heavy. This is probably dues to the double layer of military grade pvc, but it is always a give and take, so I’ll take durability. After getting on the board in the water I was pretty Jazzed. The leash is nice and comfy around the ankle and the pad (like we talked about already) feels soft yet still grippy.This board is VERY stable! People who fall off of this should maybe a different sport or would have to be messing around quite a bit. My friends and family who rode the board also concluded that this was really easy to ride and very stable. Because of that, I would say that this is a great all-around board for beginners. Once paddling, I was able to get good speed up and keeping a straight line is pretty easy to do on this (triple fins help!). I have to say that I love the carbon paddle and how light it is, but it is a little too good. When I stroke really hard and fast, the paddle would vibrate back and forth in the water. This is because of the super smooth face on the paddle. If I compare this paddle to my aluminum 3-piece Bravo paddle, I notice the V-grove down the middle of the face missing on the carbon fiber paddle.This is there to prevent the jostling or vibrating as you paddle. I think if they added this V grove into the carbon fiber paddle, it would be my new favorite paddle for sure! Seriously, even with the vibrating I love this paddle. It is just so light and feels so good. Riding the board itself is fun and paddling around all day would be easy on this board. As noted earlier, it would make a great yoga board because nice deck pad and the extreme stability. I would even say that it would be good for fishing, but there is limited tie downs and places for gear so maybe not. The tie down it does have on the front is probably the weakest area of the whole board. The most I would use it for is to hold a flotation device or maybe a water proof backpack. The hold down straps are just too light and flimsy to trust for me. If this was a touring board I would be disappointed in the straps, but this board is for flat water fun so it isn’t too much of a downer. It’s an inflatable, so there is a limit to the speed you can expect from this board. But as far as that goes, I get around quickly on this especially because of the ultra light carbon fiber paddle. I would honestly say that overall, most inflatables are all about equal in speed on flat water. The only factors that change this would be how much surface area (width and length) each board has. This has a lot of area, but still feels quick. The paddle does help. 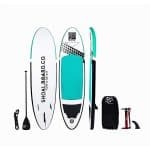 This really is a great paddle board package for anyone looking for a paddle board that they can hike with or can fit into a car and is quality with a decent price. I would also say that this is great for beginners or anyone wanting to learn to paddle board. It comes complete with everything you really need and anyone can have a good time on it no matter their skill level. With a 300 lb capacity it should suit and cater to a lot of people. This package is definitely worth the money to me. I would consider this a lake and calm river board. Not sure that I would take it in the ocean unless it was a calm day and with friends. I would not personally use this for whitewater or surfing as there are better boards in my opinion for that. Great board and package for a solid price. I’ll update the blog in the months to come as we test the durability and I promise that I WILL BE USING IT! It is a super fun and easy board that everyone can enjoy. 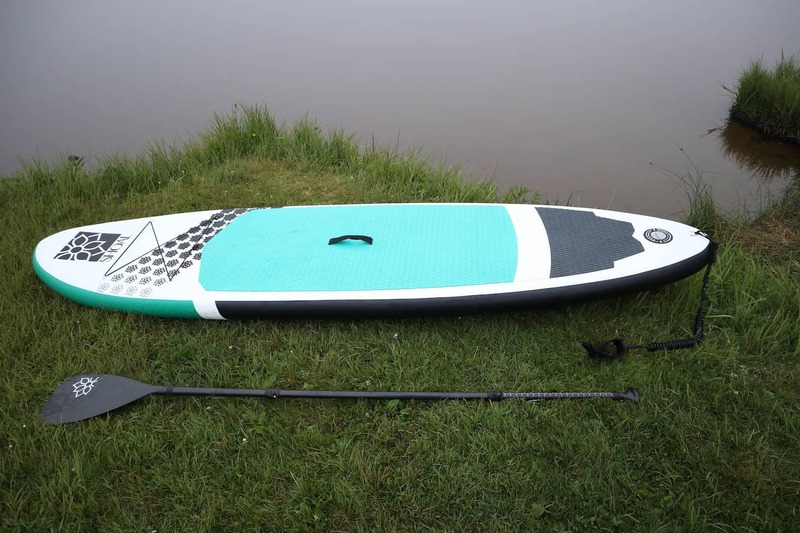 If you or your company have a paddle board that you would like us to review, please contact us here to get more information on how to get your board or gear reviewed. As always, be sure to comment below and let me know any thoughts or personal experience with this board as well! 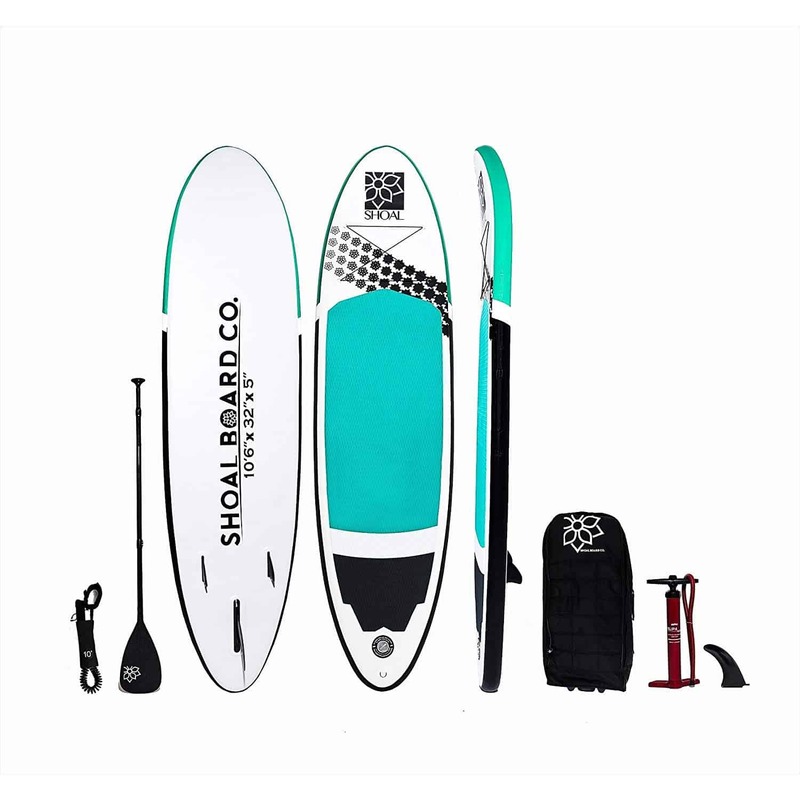 Shoal Board Co All-Around Inflatable SUP Review	Overall rating:	5	out of 5 based on 5	reviews.